Now that Adobe Flash has virtually disappeared, it seems that we don’t have so many opportunities to create interactive content. Many education organisations used flash to create quiz tools and interactive mini applications that required interaction from the students. Although Flash was targeted as an animation tool, many education products were making use of the interaction components of flash and the ease of publishing. Interactivity is now delegated to video, audio and clicking links in a menu. Then we have the custom sites with amazing interactivity that let you do maths calculations or any number of amazing drawing and quiz tools. But what if you just want to add something basic to your own content? Below is a very basic example but it shows that we can add some custom interactivity to the content and make it a little more interactive for students. Obviously, you don’t want to add just ‘any’ activities, but this gives the students a chance to reflect on what they have learnt and see if they have really paid attention to your video, audio or text content. 1. Star wars is the second best movie series except for episode 1, 2 and 3? Just my opinion…. There was some dodgy acting in 1,2 and 3, but the rest were awesome. 2. Vegemite and cheese tastes better than peanut butter and jelly? 3. Holden is better than ford? 4. Should we make it harder to become a school teacher in Australia? Teachers should be highly trained and skilled. 5. Android is better than iOS? 6. Is the weather report the same as gambling? 7. Should all schools use mobile devices in class? I don’t think so, it’s sort of not always a good idea. Driver training class or football. 8. 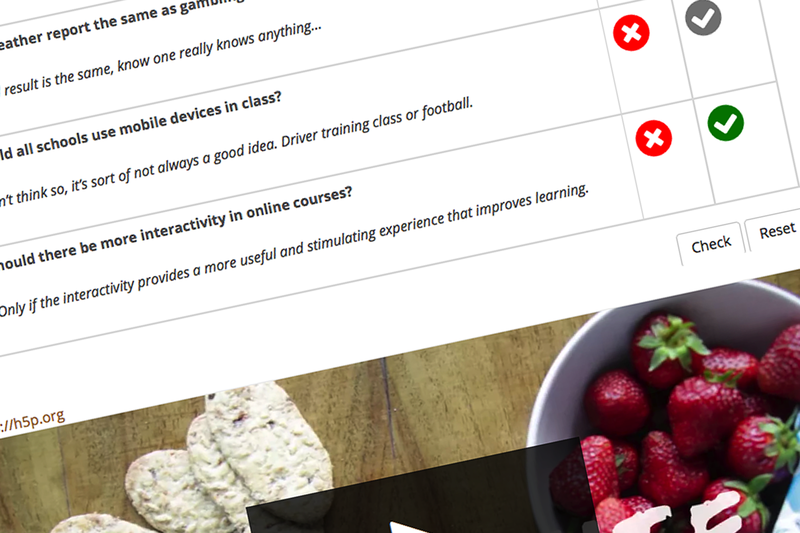 Should there be more interactivity in online courses? Only if the interactivity provides a more useful and stimulating experience that improves learning. H5P Example of interactive video. There are so many possibilities that will now work on most browsers and on mobile devices, we just need to start being creative, start experimenting and see what interesting, interactive ideas we can create that will enhance our online courses. If you are interested in the code for the first activity, let me know below or if you have some ideas you want to try, send me some details and we can have a chat about how we could make your idea work in Moodle.